If your home is among the 60% of U.S. households that have pets, you probably know all too well how hard your beloved four-legged friend can be on floors. Sharp nails can scratch or snag flooring. Tracked-in mud and other debris from the outdoors can leave behind hard-to-remove stains. Food and water bowl spills can cause water damage. And of course, there are the dreaded “accidents” that not only stain floors but also leave lingering odors that are often impossible to mask. But the fact remains; your pet is a valued part of your family. 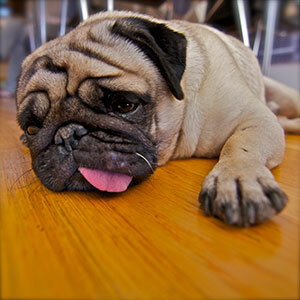 So how can you keep your pet while also keeping your floors beautiful? Many pet owners facing this flooring dilemma are discovering the advantages of today’s luxury vinyl tile. The hottest trend in flooring right now, luxury vinyl tile (referred to as LVT) offers the perfect mix of high-end style and exceptional durability. Applying the latest in imaging and embossing technologies, today’s top vinyl flooring manufacturers, including Congoleum, Mohawk, and Shaw, are impressively capturing the colors, textures, and grains of natural materials such as domestic and exotic woods and popular stone, including marble, travertine, slate, and porcelain – with amazing realism. Offering tons of stylish design options, LVT includes all the latest trends. For example, the Prospects Plus series by Mohawk features a beautiful selection oversized 6" x 48" planks that mimic the look of sought-after wide-plank hardwoods like Maple, Oak, Cherry, and Chestnut. For a high-end stone aesthetic, the Avante collection from Earthwerks offers 12” x 24” tiles in four beautiful marbled tones. Or, jump on to the big “gray” trend in flooring by choosing one of the four rich gray tones available in Shaw’s Easy Style collection of 6” X 36” beautifully infused wood and stone visuals. While limitless decorating options make these floors a wonderful addition to any home, perhaps the biggest perk of LVT is that it can take a beating – especially when it comes to pets. A specialized wear layer, often made from highly resistant PVC (polyvinyl chloride), makes LVT exceptionally resistant to scratches, scuffs, indentations, and stains. And, unlike most natural surfaces, LVT won’t chip, warp, or yellow. Tiles are also naturally water resistant and won’t swell or buckle from moisture. So sharp claws, tracked-in mud, spilled water bowls, or pet urine that can easily damage real stone or solid hardwoods, is not an issue with LVT. Since LVT is typically thinner than real hardwood planks, stone, or ceramic tiles, it is much easier to install over most existing flooring. Generally, a padding or underlayment is not required, but it is important to install LVT over a flat, dry surface so that no water seepage occurs beneath the flooring. Floors can be glued down or floated. And many products include click-and-lock systems, which are perfect for DIY installations. Before installing LVT yourself, however, check the manufacturer’s warranty. Some manufacturers require a professional installation to validate their warranties. Once floors are installed, occasional spills and accidents are easy to clean. Just damp mop with water and the manufacturer’s approved cleaner, and floors will stay looking like new. Worried about your pet’s comfort on these floors? Consider that LVT is often less slippery than many natural surfaces, and some tiles include a slip-resistant layer for added safety. 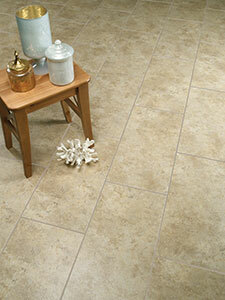 LVT is also quiet to walk on and feels much softer and warmer underfoot than ceramic tile or stone. And many manufacturers like Home Legend offer environmentally friendly products that are good for the Earth – as well as your pet. 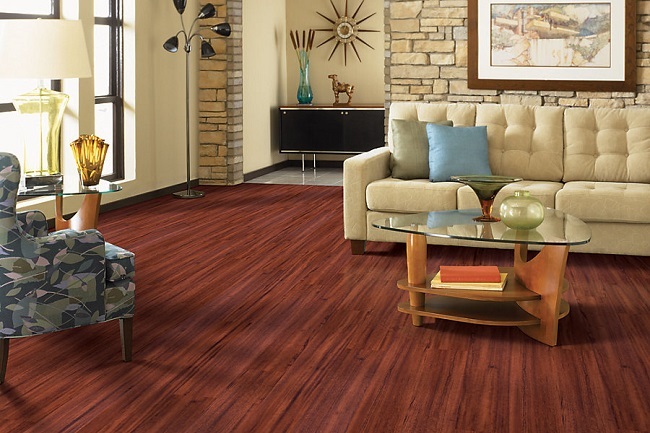 To find out if luxury vinyl tile is right for your flooring needs, contact us. We’d be happy to answer all of your LVT questions.